Hi, I am interested in your 1968 Dodge D/W Truck (stock #5018-CHA) listed on Autotrader for $11,995. I'd like to get more information about this vehicle and confirm its availability. This is a very cool vintage pickup that is going to let you choose your own adventure. 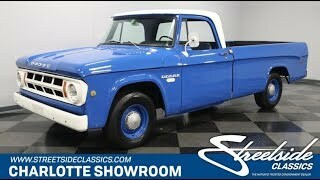 You can buy this affordable 1968 Dodge D100 to use as a turn-key honest classic cruising pickup. But since these are always a rare sight in the classic scene, its also the perfect candidate for any build from a factory original to a Mopar hot rod. Youre looking at pickup that will attract attention in the vintage truck community. After all, Dodge always produced less than Ford and Chevy. But more than just rarity, it has a style all its own. You see it in details like the tasteful crease that runs from headlight to taillight and the hint of overhang on the cab. The blue paint was recently resprayed to give it a higher gloss finish. Plus, the white elements on the roof, grille, lettering, mirror, and bumpers give it a coordinated two-tone personality. This is a desirable long wheelbase version, so theres plenty of work left in this Dodge. And so youll love that the long bed is even protected by a modern liner. Inside, the exterior blue is continued on the door tops and pillars. Its joined by black on the carpeting and dash. A great midpoint between these two colors is the dark blue bench seat. The intricate pattern on this really gives the truck an original/survivor-style presentation. The dual-spoke steering wheel has that perfect vintage truck feel, and it gives you a clear view of the correct full gauge panel. So the whole interior has a very clean and correct atmosphere. Correct presentation extends to under the hood, too. The bold red block against the blue engine bay is a real standout. This is believed to be the original 225-cubic inch inline-six that this pickup was born with over a half-century ago. Sure, that engine bay could easily swallow any Mopar muscle V8 you want to drop in, but were always excited to see a vehicle that carries this kind of history. Slant six motors are great for durability and torque. Since you get to take full advantage of it with a classic column-shifted manual transmission, you get to experience what a mighty Mopar motor this really is. In case you havent noticed, we are already big fans of this truck as it is. Theres a huge amount of potential from mild to wild, but until you decide its next chapter, this classic pickup will provide you with plenty of smiles. Call now!